2016, I will not miss you. Yes, there were celebrity deaths that were saddening, but that’s life. 2016, to me, was objectively a really bad year. If you’re reading this, and you had a fantastic year, great! I don’t mean to diminish anyone’s triumphs, successes and joys, but honestly, I’ve lost sleep this year about what a crap year it’s been, from the random acts of violence, to the exposed schisms in our country, to the lunatic that we put in the White House. On a personal level, the year started with a car wreck, nearly killing my brother, but only “luckily” breaking both of his legs. The first few months of the year, we spent hours at the hospital with him, and then in the nursing home. While I have no problem waiving buh bye to 2016, I can’t say that I don’t look upon 2017 without trepidation. It’s no secret I’m a liberal, but it’s not that I fear a Republican in the White House – I would have been ok, not happy, but ok, had a McCain won, or a Romney – I wouldn’t have felt like we were all going to die. But, I truly fear the fascist madman soon to be in the White House. But, what can you do, just hope for the best I guess! Ali Edward’s One Little Word Class. I’ve picked a word before. I’ve picked a lot of words over the years. I’ve even put them in the sidebar of my blog. But, by March or April, even February, the word is long forgotten, and certainly not a prism through which I’m making choices. So, to help me along, and commit to my committing, I’m joining Ali Edwards for her monthly prompts and exercises designed to help you incorporate your word into your life. This is an A6 Hobonichi Techo. Basically, its a small, one day on a page planner/journal/notebook. 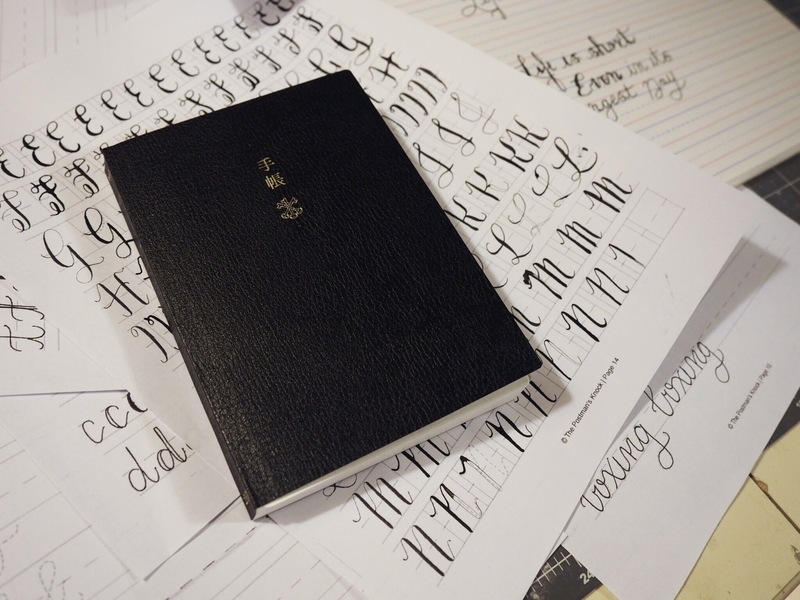 I struggled between buying the A6 and the larger A5, but I settled on the A6 because I thought it would easier to live up to my commitment, and journal every day in a smaller space, and the A5 is in Japanese, and the A6 comes in an English version. I also ordered a used Chic Sparrow traveler’s notebook cover for it, so I’ll report on that when it arrives. If I outgrow the A6, the A5, the Cousin Avec, comes in a six month size, and I could also size up for the second half of the year. 3. 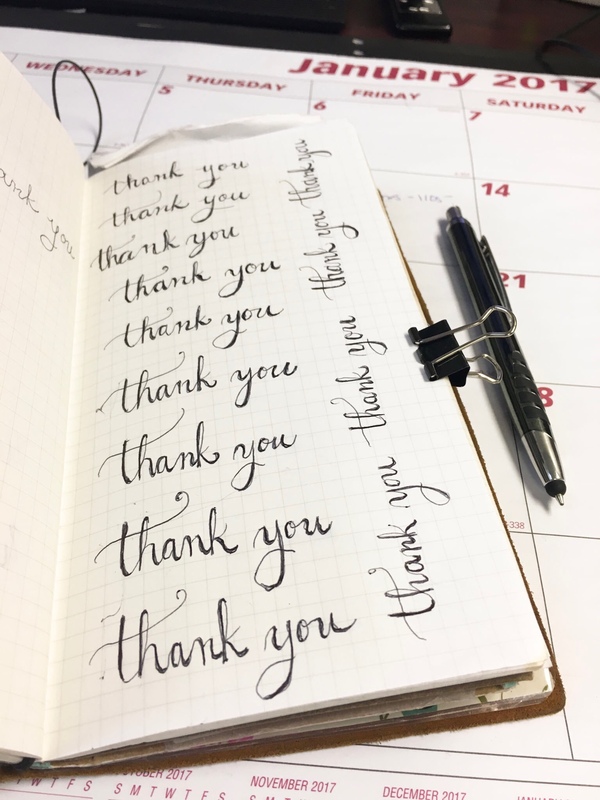 Also on the commitment list for 2016 – Hand Lettering! I have decided that 2017 is going to be my year of hand lettering. 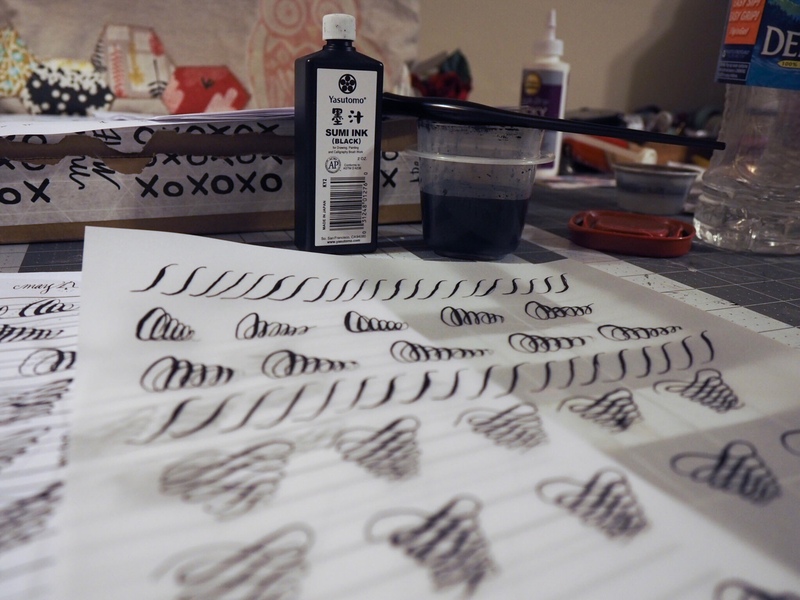 Right now I’m exploring – I have a dip pen, a Tombow dual brush pen, and a Tombow fude on the way. 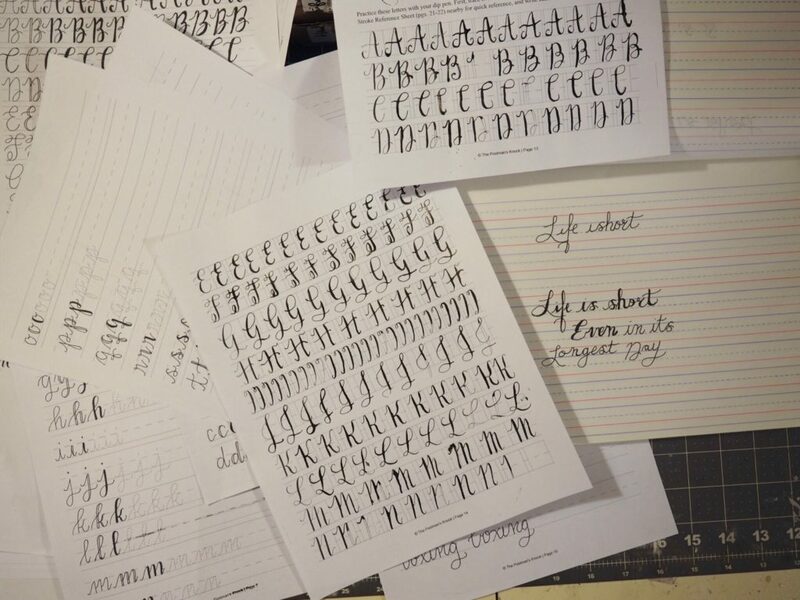 This is my creative art commitment for the year, because that’s what hand lettering really is – drawing letters. And rather than willy nilly committing to this online art class, or that one, this is what I’m doing this year – and I will hopefully add some watercolor to the mix. To help me along with my commitment, I’ve created an instagram account just for my lettering endeavors – OliveInks. And, to support this commitment, I’m working my way through a class on Creativebug, as well as joining in on some Instagram/FB challenges, primarily this one for now, #ShowMeYourDrills. I’ve also signed up for Skillshare, using their 3 mos/99 cents promotion. Can I just tell you how relaxing and soothing these drills are! and 4. Diet, Health and Exercise. I’ve gained 20 lbs since moving to the suburbs. It’s like it happened over night, but it really happened over four years. Mostly this year though. I’m a stress eater. But, I’ve got my smart watch, counting my steps. And, I’ve bought a new bathing suit to start swimming in January. And, I’m going to try to be kind to myself, not beat myself up, acknowledge that this is unlike diets in the past when I wanted to lose 5 lbs, but didn’t really need to lose 5 lbs. Right now, I need to lose the 20lbs because my clothes do not fit. This is a big commitment; it’s not going to happen overnight – but I’m committed. So, goodbye 2016! For the world in general, for 2017, I can only hope, but for me personally, I am committed to making 2017 better, more productive, more creative, and healthier – if my summer clothes fit, I’m going to call 2017 a success. Take care, everyone and Happy New Year!